Making a House a Home: A pumpkin shortage???? Still, this doesn't AT ALL change the fact that my family and I are really craving Pumpkin Sausage Pasta and Thai Style Chicken Pumpkin Soup!!! For real! Here in Massachusetts, I was searching high and low. My dog needs it occassionally for his digestive system. I can't find it anywhere. I didn't realize there was a shortage until I asked at my 5th grocery store. It's affecting us, too. I can't make several recipes that I've been longing for. I think we should have planted pumpkins this year. Use butternut squash! Halve, then bake at 350 for 30-40 minutes in a little water until soft, then wring it in a dish towel to squeeze the excess water out. Really? I heard it was coming but last time I happened to wander down that aisle, I saw plenty. I don't actually buy canned pumpkin, so I just cooked up a couple large ones last fall and froze them. No shortage in my freezer, haha! I noticed this also! 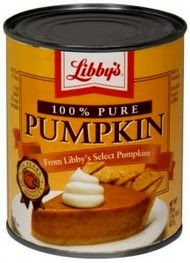 I always make pumpkin spice muffins and the Libbys is not on the shelf! There was some canned organic pumpkin still on the shelf. Im going to go stock up! Very hard to find here also. Very glad my parents plant an abundance every year. I remember it was very hard to find last year too. My suggestion is if you use it buy it when you see it because it got even more scarce as we got closer to the fall. I also found sweet potato puree at a local store and used that - works pretty much the same. I've planted some pumpkins in our garden this year so hopefully, we won't need to go searching for any. You will laugh at me, but I saved some from last Fall. I kind of stocked up because I love it. Thanks for telling us about the shortage. I am growing my own this Summer. Hope they turn out. That explains why I haven't been able to find any pumpkin in the stores. I am a pumpkin fanatic and my storage supply is running dangerously low. I have tried to stock up but have only found pumpkin at 1 local store in Utah. @Emily - which store in Utah?? I Planned a Pumpkin Potluck part this Sunday at 4, having NO idea there was a shortage! EEEK!